especially about women from more than 100 years ago in China. I like hairpins very much. I don't know why. Some woman with special abilities to see hidden secrets said I used to play with hairpins in one of my past lives. I collect a lot of old hairpins (more than 1000 objects). They are so very beautiful and made using very a good technique (metal working). Most of them are antiques (more than 100 years old) so some of them are not in good condition. That's why I went back to university to learn cultural heritage conservation. I want to repair and conserve them for the future. The antiques will live longer than I will and I want them to remain in the best condition, with no more deterioration. My dream is to build a hairpin museum. It sounds very easy but it is a big dream for me and a difficult dream because I am not a rich person. I can not afford so much money to build a museum unless I win the lottery. I know other people have much more beautiful and better quality hairpins than me, maybe compared with their collections, mine is nothing special. But I still hold true to my dream and hope it will come true one day - that I can find some way to protect my precious hairpins. In 2011,I discovered a way to make my dream half come true. I began to build a "virtual museum on the Internet and I am very happy you are reading this page. 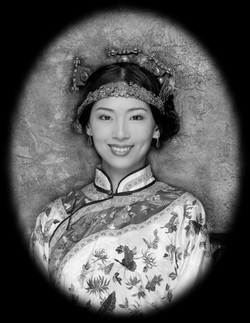 In order to know more about ancient women's dress, I also collect old postcards about Chinese women from 100 years ago. They all wear traditional dress with old type hairstyles. Some of them have bound feet, all of them are special for us nowadays. You can see these old postcards in my museum image gallery. I want to have a series about Chinese women on the postcards, then publish a book about the secret behind the beauties on the postcard. Many of them have really interesting and mysterious messages on the back! I really hope if one day I build my real Hairpin Museum - one which people can walk into. One day you can be one of the VIP visitors. Today that's only a dream but I know it will be come true one day. Maybe with your help.